After a successful discharge in May 2018, Adele Flanagan returned to stay with us on July 13, 2018. She returned to us with the need for improvement with her gait, balance and lower leg strengthening due to changing home needs. Sandy Gomas, our RN Care Manager, greeted Adele and her brother upon arrival. Katie Cullum, Patient Concierge, and Tom Cirrincione, Director of Rehab, met with Ms. Flanagan within an hour after arrival. When Adele needed to be more independent at home, she reached out to Sandy, our RN care manager to discuss returning to The Emerald Peek. Sandy worked very quickly with the team to make sure we had all that Adele needed to return to The Emerald Peek. Patrina, certified occupational therapy assistant, and Julie, physical therapist, were familiar with Adele and her desire to work hard and meet her goals. Both therapists set goals to focus on increasing Patrina’s independence. Patrina set goals of increasing balance, toileting tasks, and lower body dressing, all without hands-on assistance. 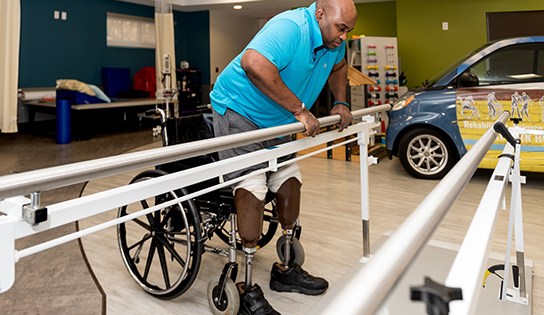 For physical therapy, Julie focused on lower leg strength for both the left and right leg, increasing her ambulation length from 30 feet to 100 feet, also without hands-on assistance. Adele met all of these goals and was able to ambulate over 175 feet the day before discharge.